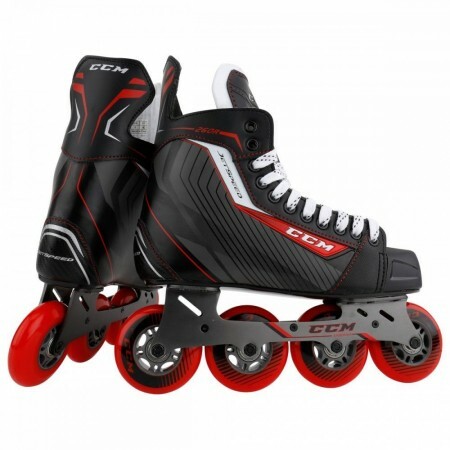 Bringing CCM's revamped fit profile to the world of inline, the 260's will provided the closest fit and best heel lock of any CCM inline skate to date. A synthetic embossed shell is durable enough to face pavement and provides an ample amount of stiffness for your average skater, while an injected outsole helps maximize energy transfer. The chassis of the 260 is CCM's FastFrame a lightweight aluminum frame, outfitted with durable all purpose wheels that can stand up to the asphalt in the street. Weight: 1240 Grams Weight of a single skate measured in grams (Sr 8.0D, Jr 4.0D, Yth 12.0D). Wheel Type: CCM Wheels Type / Brand of the wheels. Bearing Type: 608 Ball-bearings ABEC 3 Brand / ABEC Bearing rating. Boot Construction: Synthetic Embossed Shell Type of material the product is primarily made of. Chassis: Dual FastFrame Aluminum Type / Brand of the chassis. Outsole Construction: Injected Type of material the outsole is made of.